We had a great time at the villa. Each morning, we woke up to the lush green and nice pool. It is a serene and peaceful environment. A 4 star hotel with a 5 star feel. We arrived at about 11am and the room was not ready. The attentive staff (nice bubbly lady) realised that we were hungry and offered toasts, drinks and fruits. Superb service! The room was fantastic. The open shower offered back-to-nature feel. Good for the soul.... There is also free meditation and yoga lesson in the room. Just need to pre-book. The villa is not by the main road. Need to make arrangement with hotel to send buggy to pick or send us to the main road. However, they were very prompt. Wish I could be there now! You need buggy to bring you to villa otherwise it take 5 mins walk. Pool is small and not ideal if you want to do lap swimming. The villa need to spruce up as furniture is old otherwise it is cosy. There are 2 other villa Temuku & Samkhya within same compound. Nice open area for massage & cafe is Temuku serves excellent soto madura & nasi goreng. we booked 3 bedrooms villas even though there is just 3 of us. 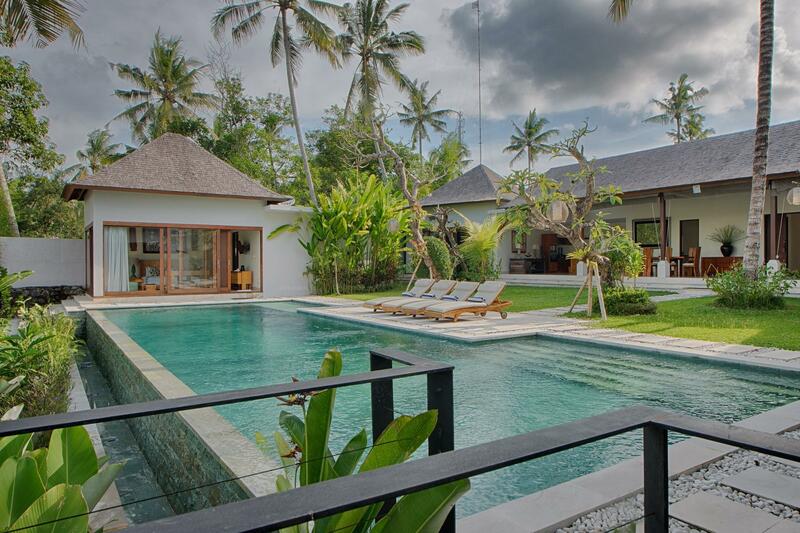 we totally enjoy the privacy of the villa and it comes with a huge pool and overlooking the rice fields which is the reason we book this.. staff are friendly and food is nice. but need to walk out or take their buggy to reach the main road. cars cannot come into the villa. I loved everything about Villa Santun. The staff was excellent, the food was great, and the accommodations were exceptional. It is about a 10-minute car ride from the city center, but they have shuttles to and fro several times a day. For times outside the shuttle, it was only about 7USD to go downtown. Highly recommended! This resort is a hidden gem - away from the hustle and bustle. Access via a golf buggy, which was a hilarious experience every time we were transported to and from the main road. Staff were professional courteous and polite. There was nothing they could not do for us. They wore (proudly) the most beautiful batik uniforms. 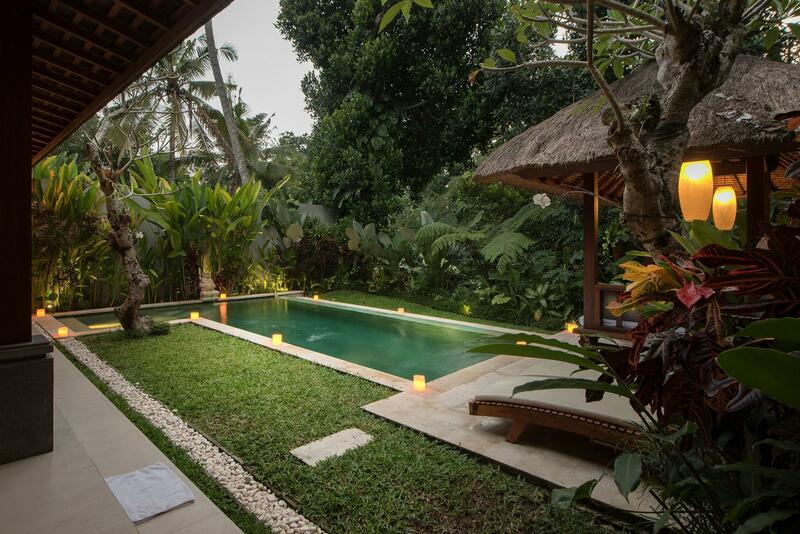 Rooms were luxurious and were made up of quality soft furnishings and every room boasted fabulous Balinese artwork. Bathrooms and architecture were AMAZING. Great place to totally relax and unwind. Will definitely be back. 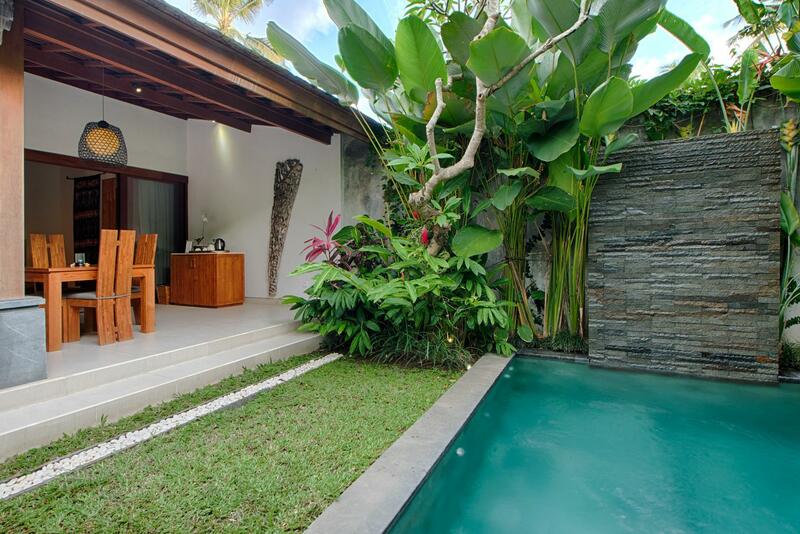 Our 1 bedroom villa looks exactly like the photos, clean and well-maintained. Lizards and ants were common at the outdoor area but not an issue. The villa was located off the main road and it was convenient that they provided us with a mobile to call for their buggy shuttle. It was good that they provided free shuttle service to ubud center. Breakfast was delicious and we could choose between a few menus. Had a couple of meals delivered by the next door restaurant and they were all quite decent. Staff were very friendly and welcoming, even their staff at the taxi drop zone from the next door sister villa helped us in every way possible. We joined their complimentary morning walk and it was a good walk through the paddy fields. 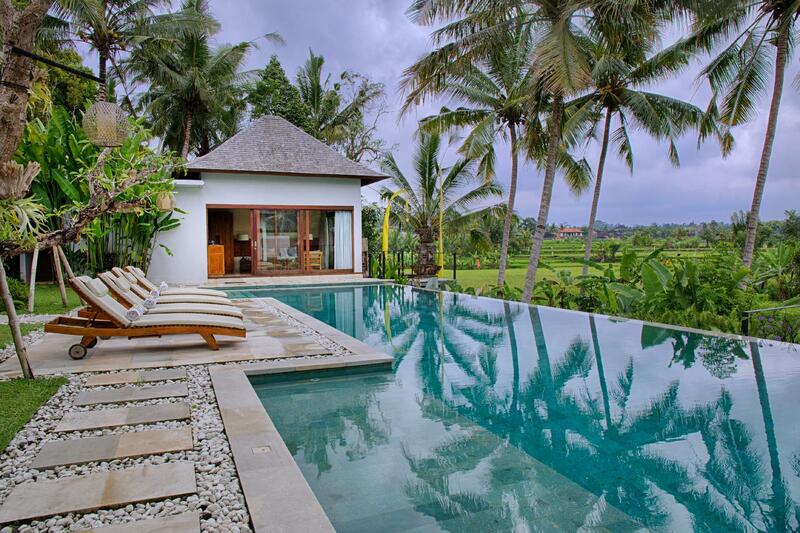 Would recommend the villa to others looking for a peaceful and quiet stay in ubud. I would suggest they provide more regular return shuttle service from Ubud Centre, especially in the evenings. Also, their prices for taxi service can be more competitive. All staff are very helpful, especially Gita. 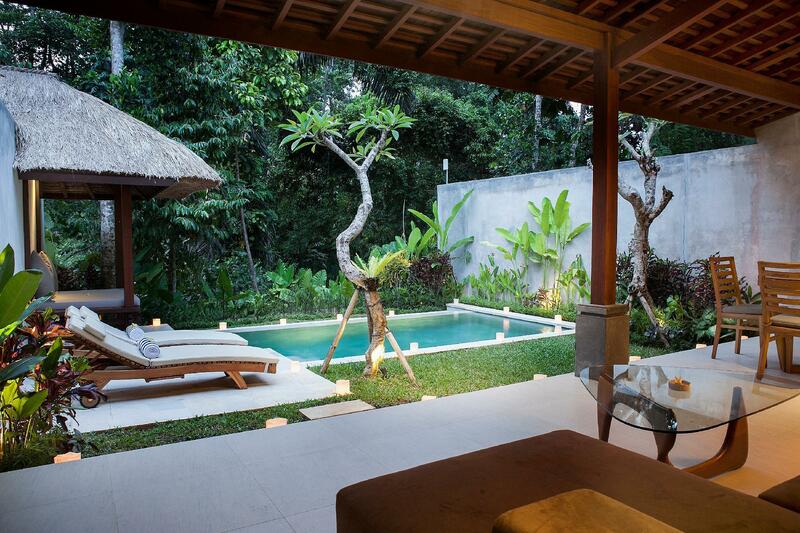 The hotel provides free transporation from the villa to Ubud Centre (golf cart from villa to parking area). Even though Agoda mentioned breakfast are not included, the villa provided us with free delicious breakfast. Just that the roosters will wake you up at 6am. Overall, I'm impressed with the surroundings of the hotel. It has great view of the paddy field and its always a great idea to have an early walk in the field. 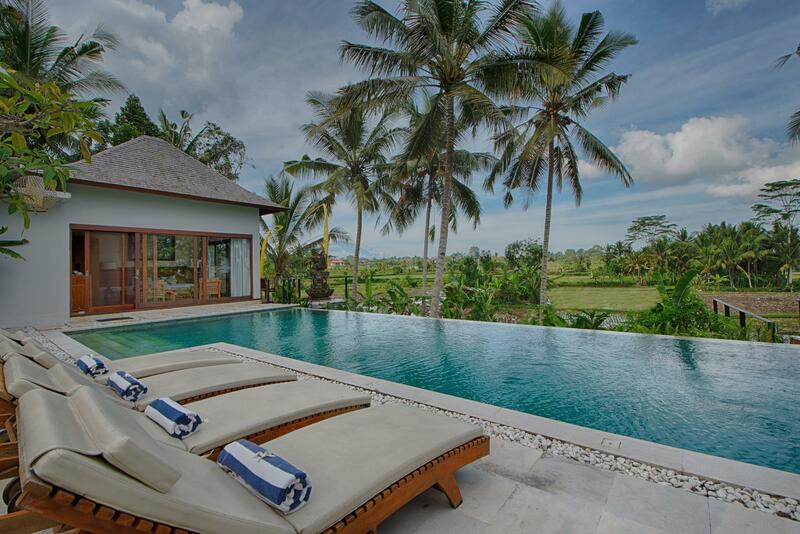 The villa is clean with nice private pool. When I walked into the bath room, I'm impressed with their effort in placing the flower petals in the bath tub and lighting around it. However, when I looked closer, I realized there are worms in the tub which are still wriggling. It may have creep in from the plants nearby or either from the rose petals. Food provided in the villa is ok, not fabulous but it's sufficient. This place is out and away from the town (about 2 min buggy drive out to the parking area and 10 min drive to the town) so it is very peaceful and totally free from pollution. I am in love with this hotel. It has the best combination of all. The staffs are so friendly. The room is set such an romantic setting. The breakfast offers such a wide variety where the staffs cook for us and send the breakfast to our room. It is so peaceful as we can hear the bug singing. So nice that we can just enjoy our time in the room. Highly recommended as they price is reasonable too! Accommodation was great - though I'd suggest don't bother with the restaurant. Everything they cooked from fresh ingredients was fine, but it was pretty obvious that all sauces and spreads and stuff like that were straight from a bottle or jar.